You'll have to be quick this bank holiday week to take advantage of Amazon's Summer Sale as it's only on for a few more days, ending on the 31st August. My pick is this 20cm Meyer non-stick French skillet frying pan in a lovely almond colour at just £4.99 (saving over 60% off the original price of £13.97). Perfect if you're going for a shabby chic or vintage style kitchen. 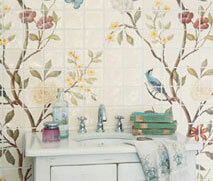 Want a pretty wallpaper effect for your bathroom or kitchen? Take a look at Fired Earth's lovely handmade and hand decorated chinoiserie style tiles from tile maker Alice Gibbons and decorative artist Adam Calkin. Dragonfly, butterfly, bird, foliage and floral tiles are ordered individually or in small sets and can be combined to form panels of 4-36 tiles, which together create the full 72-tile decorative panel. The best bit? As this series is the Fired Earth product of the month for August, the tiles are currently 15% off. Prices range from £20.75 for the insect tiles, to £335 for the 12-tile panels. If you're hoping to bag some bank holiday sale bargains, check out WhereDidYouBuyThat.com for 10% off and free delivery with the discount code WD08BH. 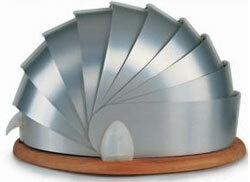 I have my eye on this fabulous brushed aluminium Armadillo breadbin. The promo code is valid until Tuesday 26th August 2008, so be quick! Regular readers will be used to my tea towel obsession by now (new readers, you have SO much to look forward to! ), and it's been a while since I've featured some dishcloth lovelies, so take a look at the latest to catch my eye. 'Nelly' the elephant, 'Milky' in yellow polka dot and 'Milk & Two Sugars' all £7.50 each. The lovely Paula of Kitty and Polly sent us a 'Milky' one to try and it's just gorgeous. They're made of a rather lightweight cotton, so probably better for cleaning glasses or for decoration rather than mopping up your dishes. Paula has also been very generous to Lovely Things readers and is offering an exclusive discount code for 20% off everything across the store! What's more, it will last right until the end of the year (31/12/08). Perfect for Christmas shopping or just buying gift for yourself. Just visit the Kitty & Polly site and enter LOVELY at the checkout. Discount code for dishwashers at Currys - be quick! Just a quick one for you if you happen to be looking for a new dishwasher. Currys is offering a special 10% off discount code for use on all freestanding dishwashers. The code is AWDISHTEN and expires on 14th August 2008, so you'd best get in quickly if you want to take advantage of it. Shown is the Baumatic SB5 dishwasher in yellow, the MG5 in orange and the TG5 in red (web exclusive price of £452.99 each for orange and yellow, £455.99 for red). Perfect if you want to add a bit of vibrant colour to your kitchen and a dishwasher that's A-rated for energy efficiency (and if you're not one of the Lovely Things pink brigade). I love the idea of this 'Tea Stick' from Utilo (£12.95). If you're a traditionalist who can't abide the words 'tea' and 'bag' in the same sentence, it's perfect for making just one cup without the fuss of a teapot. It won't be available until mid-August but you can pre-order now. 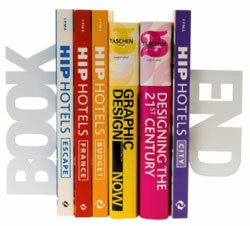 Looking for modern book ends? This pair are certainly self-explanatory! They're £16.99 and available now. Thanks to the very generous Helen at Amode, they're currently offering a 10% discount on all products just for Lovely Things readers for the entire month of August. The coupon code is LOVELY08 and is valid when you visit the Amode.co.uk site until 31/08/08. Lovely Liberty has just announced a sale of up to 30% off selected kitchen and dining items, and 25% off some of their Liberty of London home ranges. Unfortunately despite the new Liberty of London online shop offering a selection of their gorgeous bags and accessories, there's no online shopping options for homewares at the moment. Pictured is one of the kitchen/dining sale items, a rather pretty blue-glazed cake stand on sale at £13.12, down from £18.75, but you'll have to pop into the store in Great Marlborough St, London to purchase. One of our most popular features on Lovely Things is the piece on pink kitchen appliances. 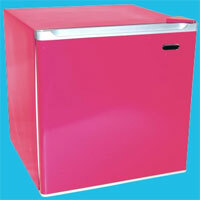 Here's a little something for our pink-crazy US readers: the Haier pink refrigerator. The Haier 'Color Cube' is a mini fridge with just 1.7 cubic foot capacity and a tiny freezer section. At under 20 inches tall, it's perfect as a drinks fridge, for the office or as a personal fridge if you're in a shared house or dorm, or if you just have a teeny tiny apartment and don't have a lot of room for electrical appliances! The best prices I've found to buy online are at Provantage for $81.46 in pink, green or black, or just $76.32 in blue. According to the Haier US website, it's also available in orange and red.